Did you miss Part 1 (Episodes 1 to 5)? Or Part 2 (Episodes 6 to 10)? We got 3 Official Stills for this episode via SpoilerTV. Wow. There were a few BtS pictures and even some “paparazzi” pictures via Just Jared, but that’s not the same. One of the stills is MacGyver fiddling with a microwave. I can’t even remember if and where that scene took place. That’s a first. MY FAVORITE: Not that much to choose from, is there? I guess the one of Jack and Diane. It’s nice to see one of the guest stars in a Still. Riley’s mom seemed to be an interesting character, and I like the actress (although I only know Michael Michele from Emergency Room). Too bad she just disappeared, despite implying that she and Jack might try dating again. NOW THAT’S DISAPPOINTING: Only 3 Stills. That’s how you do promo? And still no SAK. Ah. The episode that screwed with everything. For this episode, we got 6 Stills via SpoilerTV. Half of them feature the prison scene with Murdoc, Bozer and Riley. No Still of Thornton as if she’s already eliminated. MY FAVORITE: Hm. Maybe the one in the church that was also used by CBS for the Press Release. My second pic would have been the one of Riley and Bozer in profile. NOW THAT’S DISAPPOINTING: I don’t really like the episode that much. And I’m not very fond of the Stills for this episode, either. For Episode 13, we got 5 Stills via SpoilerTV. 3 of them are about MacGyver in the woods, which makes it automatically interesting if you’re a fan of the Original Show. MY FAVORITE: Of course one of MacGyver out in the woods, doing “outdoorsy” survival stuff. NOW THAT’S DISAPPOINTING: 5 Stills isn’t all that much, but luckily they’re interesting. Still no SAK, although there’s such a pivotal scene with it. 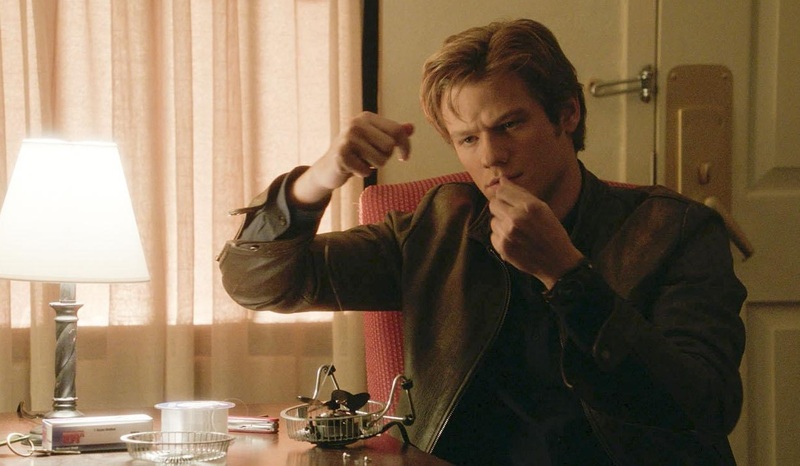 At least you can guess MacGyver is using one in the Still where he’s building the crutch. This episode granted us 5 Stills via SpoilerTV. Again, not really that exciting. MY FAVORITE: Look, there’s an SAK in full view! I mean, I HAD to chose this one. Right? This was also used for the Press Release. My second pick would have been the one of Mac and Jack walking in the parking garage, because I like the lighting in that one. NOW THAT’S DISAPPOINTING: 5 Stills in total, and 3 of them feature the same location. Come on. Give us something to get excited about. You already made some progress by including an SAK into one of the Stills. The only episode in this blog post that lists the Still Photographer on IMDb. Maybe the other episodes didn’t have one? We got 7 Official Stills via SpoilerTV; featuring 2 different scenes. MY FAVORITE: This Still just screams “Crime-Scene-Investigation”, doesn’t it? If I remember correctly, that was also used for the Press Release. The peek at the location is exciting. Even without a trailer, these stills would have peaked my interest in watching this episode. Disclaimer: My original guest-post was first published on The MacGyver Project on January 20, 2017. I made some minor changes (e.g. grammar or source corrections, link corrections, additional pictures) before re-posting it on my own blog for safe-keeping. Although the next Episode won’t air until February 3, Cast and Crew are busy filming the residual episodes for Season 1. Also, there’s a certain Family of Bounty Hunters on set! After a premiere break of 3 weeks, cast and crew took their time to join in the promo of Episodes 12 (Screwdriver) and 13 (Large Blade). On January 6, Justin Hires posted some interesting pictures of Bozer and Riley in undercover costumes while Tristin Mays shared a rather disturbing video of herself walking around the set. Seems like she got herself a new face for the day! Despite the high ratings of Episode 12 on January 6, Executive Producer Peter Lenkov didn’t have much time to celebrate. He spent the weekend editing and sharing teasers on Instagram Stories. One of these teasers was a short video of MacGyver being handcuffed in an out-of-control car going backwards. Looks like an exciting Opening Gambit! The other videos consisted of a fight in a parking garage and of MacGyver mentally gearing up to work with his new boss. 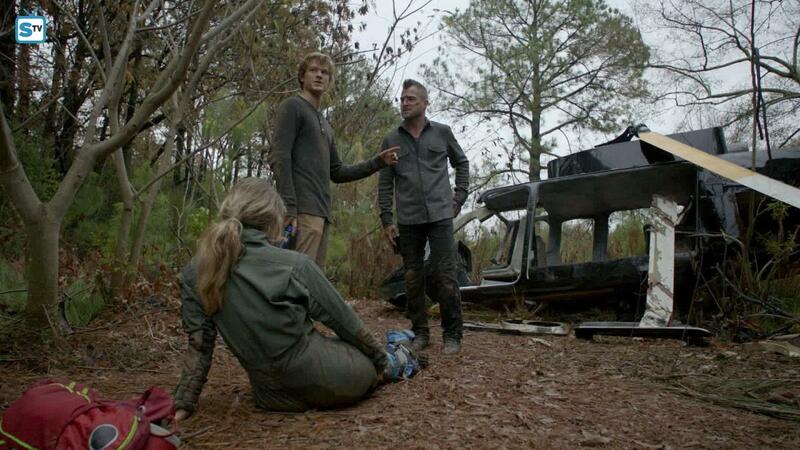 During the premiere of Episode 13, Lucas Till posted a video from set to show that they were still filming. Tristin Mays shared videos on Instagram Stories. The crew likes to play the “Paperclip Game” between takes. There was also enough time to take some pictures with new cast member Meredith Eaton. On the weekend, second unit was still filming at the Fox Theatre and in Piedmont Park for Episode 15. For bypassers, the nightshoot in Piedmont Park looked a bit like a horror movie set, though. As Second Assistant Director Cornell Willis stated, snow and the cold didn’t stop them from doing their favorite job. On Monday, production moved to “Louisiana” (aka Dolly’s Farmhouse Restaurant in Austell, Georgia) to start shooting for another episode. Several bypassers got a look at the filming process in front of the restaurant. Dolly’s also shared some pictures on Facebook; stating that well over hundred people were swarming the location. Episode 16 might be a special one for fans of the original show, because a well-known family of Bounty Hunters is back in town! Jermaine Rivers revealed on January 16 that he has been cast as Frank Colton. After asking if he might be one of the Colton’s, Lance Gross confirmed to me on Twitter that he has been cast as Billy Colton. It didn’t take long for Mama Colton (Sheryl Lee Ralph) and Jesse Colton (Javicia Leslie) to reveal themselves. Interestingly, the restrictions of posting on social media seems to have been lifted. All members of the Colton family are posting on social media; sharing tons of pictures or videos from set and from inside the make-up trailer. It’s nice to see that the new cast members did some homework and know the Coltons and the names of the actors who played them in the original show. During the premiere of Episode 12 (Screwdriver) on January 6, Extras and cast members shared some more BtS pictures of the filming process back in November. Briana Lamb had been able to stand in (or sit in) for Amy Acker (she was usually Sandrine Holt’s Stand-In) – which meant she got to wear a wedding dress and the crew to “play-fight” about who would be walking her down the aisle for practice. Preston Hillier posted a picture of the happy couple. The premiere of Episode 12 not only brought recurring characters and surprising plot-twists, but also the third-highest ratings (8.42 millions) so far. The ratings for Episode 13 (Large Blade) weren’t as high (7.64 millions), but these two episodes are also the best user rated episodes on IMDb. Also, the Hashtag #MacGyver keeps trending on Twitter, even long after the show has aired. Andrew Karlsruher, writer of Episode 13, tweeted along with the other MacGyver Writers; sharing some of the science behind this episode, but also a warning not to try THIS at home. Overall, the ratings and the 18-49 demographic numbers are relatively solid (for now, the mean is 8.1 millions viewers / 1.14 per episode). If the numbers stay that way, chances are good for the show being renewed for another season. Only 3 days before its premiere, we got the first stills for Episode 13 (Large Blade). Just hours before the premiere, we got two additional sneak peeks. Production Assistant Kait C. shared the information that Episode 15 will be directed by Stephen Herek again (who had directed Episode 11 and the unaired “Young MacGyver” pilot back in 2003) while SpoilerTV revealed the title for Episode 17 (Ruler). On January 19, CBS Express delivered the press release for Episode 14 (Fish Scaler). It will air on February 3 and was directed by Eagle Egilsson (CSI: Miami). I still don’t know why they felt the need to rush production so they can premiere the show in September – only to take so many breaks in between anyway. I think it’s quite annoying to wait so long; especially after a new regular cast member has joined the team. Blue Barn Creative recently had the opportunity to create a promo for CBS and Victorinox for the Huntsman Boy Scout Swiss Army Knife. They used the tagline “Always Be Prepared” and footage from the Pilot Episode. On January 13 – right before the premiere of Episode 13 – ET Online aired a promo video including a greeting from new regular cast member Meredith Eaton. The video granted another glimpse at the Photoshoot for CBS Watch! Magazine. The Magazine will feature Lucas Till (Dresscode: Suit and Parachute) on the cover and will be available on January 23. Understandably, Lucas is very grateful to be on a major magazine cover for the first time. Justin Hires also gets a full photo-page in this issue. As noted above, the Coltons are coming back! Jermaine Rivers had revealed that his role as Frank Colton is a recurring one; so we should be prepared to see them again. You might have noticed that Jesse Colton is played by Javicia Leslie, which means Jesse is a girl in the Reboot. So far, we haven’t seen a dog on set, though. I really hope they bring back Frog, too! Central Casting Georgia is still looking for a professional pool shark. Other casting calls were made for Armenian men to portray bad guys, for upscale Dutch citizens and for adults with Beachcomber Bicycles (whatever that is). On January 11, Meredith Eaton (NCIS, Boston Legal) had announced that she’s joining the show. Two days later, it was confirmed that she will be the new head of the Phoenix Foundation. Many fans were unhappy or even outraged about Sandrine Holt leaving the show and how her storyline was handled. How can the reinvented character of Pete Thornton be declared as a baddie without further explanation? It is worth to note that new boss “Matty Webber” is a clear notion to the original episode “Early Retirement” (Episode 3×12) and that Peter Lenkov has planned to bring Sandrine back soon. Do I smell a Season Finale Plot Twist coming? I sure hope so. Disclaimer: My original guest-post was first published on The MacGyver Project on January 6, 2017. I made some minor changes (e.g. grammar or source corrections, link corrections, additional pictures) before re-posting it on my own blog for safe-keeping. Production of the reboot was on hiatus until a few days ago. Cast and Crew are ready to film the residual episodes for Season 1. Cast and Crew enjoyed a short break over Christmas to spend some well-earned time with families and friends. CBS therefore posted the MacGyver Holiday Survival Guide and a short video of Lucas Till and George Eads wishing us Happy Holidays. More people took the opportunity to share pictures of the SAK they got as a Christmas Gift; e.g. Tristin Mays, Technical Consultant Rhett Allain, Dana Till (Lucas’ mom), Boom Operator Robert Maxfield or Camera Operator Tiko Pavoni. For the end of the year, FlyWorx shared an old video of filming Episode 2 (Metal Saw) with their impressive drones. On January 4, production started again – presumably on filming Episode 15 while working behind the scenes for Episodes 12 to 14. Assistant Director Anthony Kountz was happy to be back on set. Executive Producer Peter Lenkov posted several short videos on Instagram Stories while editing Episode 12 (Screwdriver). Fans of the show were quick to save the temporary videos and share it online. Lenkov also posted some non-temporary videos; e.g. of MacGyver and Jack’s exes meeting or of Riley and Bozer with Murdoc. Tristin Mays and Justin Hires also shared some (more or less) sneaky temporary videos from Set while Lucas posted the first semi-official picture of MacGyver and Bozer in the Phoenix Foundation Lab. Justin Hires revealed what Bozer going undercover looks like: Very convincing (ahem). Bozer did much better by working on Riley’s undercover face, though. Now we know why there’s a contact lens technician listed on IMDb for tonight’s episode. Despite a snow warning for Atlanta, they’ve been filming at the Fox Theatre for another night shoot. As Peter Lenkov revealed, this episode will be quite dangerous for Riley. CBS aired Reruns over the Christmas Holidays. The ratings of Episode 5 (Toothpick, 2.52 millions) took quite a hit due to NFL Sunday Football Night, though. The ratings of Episode 6 (Wrench, 4.24 millions) on a Wednesday and Episode 7 (Can Opener, 4.53 millions) on a Friday did better. Coincidentally, I stumbled over an old BtS pic by Andres Munoz during production of Episode 7 that shows how strong the grips working on this show really are. As Belle revealed, there will to be a rerun of Episode 9 (Chisel) on Friday, January 27. So another Friday without a new episode, I guess? We got stills and a first trailer for Episode 12 (Screwdriver) on December 30. SpoilerTV also revealed the titles for Episode 15 (Magnifying Glass) and Episode 16 (Hook). On January 5, CBS released a scene with Amy Acker as a first Sneak Peek for Episode 12. As predicted in Update No. 17 back in November, Jack’s Ex Sarah Adler is getting married and Jack is NOT happy. The other Sneak Peek has Jack being interrogated while under the influence of a truth serum. In an interview with The Press Enterprise, Tristin Mays talked about her role of Riley Davis. She revealed that her character’s clothes are all her own. Since Lucas Till has a new movie coming out soon, we can expect to see and hear some promo with him during the next few days. In an interview with Parade, Lucas talked about the grueling shooting days, doing his own stunts and the reboot giving him the chance to play a “full-blown adult” for once. In tonight’s Episode 12, we will meet all recurring characters again: Murdoc, Nikki and Sarah. Even Murdoc (aka David Dastmalchian) is exited for this event. Central Casting Georgia has been looking for more policemen. Things that make you go *hmmmm*: Stage & Set has made a casting call for a woman looking like being at high shool age to portray “the best friend to one of our lead actors”. More flashbacks for MacGyver, maybe? Disclaimer: My original guest-post was first published on The MacGyver Project on December 23, 2016. I made some minor changes (e.g. grammar or source corrections, link corrections, additional pictures) before re-posting it on my own blog for safe-keeping. Production of the reboot is on hiatus until next year. The premiere of Episode 12 will be on January 6. … with an SAK! Back in November, Executive Producer Peter Lenkov had posted a picture of an SAK with the official logo for Season 1. Every now and then, other pictures showed up on social media by script writers and cast members – but it was still unclear if it was an exclusive gift for the crew or if eventually everyone would be able to get one of these as an official merchandize tool. It looks like several more of these SAKs were handed out before Christmas Break because many pictures have popped up over the last few days (e.g. by Script Writer Brian Durkin, Co-Executive Producer David Slack, Assistant Sean O’Reilly, Composer Keith Power, recurring cast member Aina Dumlao, Stuntman Michael Li or crew members “etc317“, Cornell Willis and Kirk Riley). It is quite a dangerous gift, though – Publicist Beth Haiken already suffered her first puncture wound. Additionally, Peter Lenkov has a special MacGyver Zippo of his own. Peter Lenkov confessed that Jack’s selfie habit with bad guys (before punching them) is getting out of hand. By posting a short video of David Slack demonstrating a MacGyverism involving a film cannister to the prop departement, he revealed why the show is so much fun to write for. Lenkov shared a picture and a short video for Episode 13 on Instagram. He posted some scenes for Episode 12 on Instagram Stories (where videos disappear after 24 hours), but several fansites managed to snag the material and put screen shots online. Another scene for Episode 12 with MacGyver and Jack all dressed up in church and an additional Instagram-Stories-Teaser for Episode 13 were just posted today. Seems like Mr. Lenkov is hard at work to get as much editing done as possible. On December 22, Lenkov shared a video of Mr. Henry Winkler wishing us the best holiday ever. Justin Hires was very excited for his character Bozer joining the team. He also posed for BtS-pictures with Bozer’s Elf Apron. In a video by Tristin Mays, Lucas Till tests the Golden Magic Slingshot that she got him as a gift. He doesn’t succeed on the first try, but he does succeed. Even New MacGyver needs some training, after all. Cornell Willis shared several nice pictures of the nature surrounding the set. After fighting the heat wave in summer while filming the pilot episode, fog and cold temperatures were a nuisance while filming. DP Gabriel Beristain posted pictures of him with Lucas Till and crew members on Facebook. The glossy black helicopter for Episode 13 still garnered attention among the crew. Jeffery Ellis provided a look at the crashed version of it. And it was looking so nice and pristine before! Besides filming on a roof, they also built an extra set for the scene. Extra Michael Tow showed us what serious agents Cho and Brooks look like while getting ready for filming. Meanwhile, crew member Jes tested a creepy mask – another one of Bozer’s creations? After the high ratings of Episode 9 (Chisel, 8.12 millions), Episode 10 (Pliers, 7.42 millions) wasn’t as good in numbers. Overall, the ratings are still steady, though with Episode 11 (Scissors) as the Christmas Episode at 7.67 millions. Interestingly, Episode 11 was trending much earlier (at least 5 minutes) on Twitter than Episode 10. The writers again live-tweeted during the airings; e.g. providing us with research information about the Elephant Toothpaste MacGyverism (and what happens when they test it in the backlot) or that they spent hours researching the air-raid-siren. They also provided a nice sketch by Writer John Turman that they sent to the props departement so they could build the GPS-Satellite. (At least one of them has sketching skills!). Extra/Stuntman Simon Rhee posted BtS-pictures of Episode 11 with the main cast. On December 13, CBS shared more first-look-pictures of Episode 11 (Scissors). SpoilerTV provided us with a press release for Episode 12 (Screwdriver) that will air after the Christmas Break on January 6. It is written by Lenkov, Craig O’Neill and David Slack and confirms that three major recurring characters will be back: Murdoc (David Dastmalchian), Nikki (Tracy Spiridakos) and Sarah Adler (Amy Acker). Belle revealed the name for Episode 13 (Large Blade) while Extra Michael Tow provided us with the name of Episode 14 (Fish Scaler). On December 22, CBS Express published the press release for Episode 13. It’s written by Andrew Karlsruher (CSI: Cyber) and directed by Sylvain White (Hawaii Five-0). We got two clips for Episode 11 (Scissors) via SpoilerTV. Additionally, ET Online shared an exclusive clip that reveals more of Jack’s history with Riley’s mother. If you’re interested in the songs used in Season 1, there’s a neat little site that has it all in one place. As Google’s Year in Search revealed, MacGyver was one of the most-googled search words in September. In an Interview with Matt Carter, Peter Lenkov talked about why he brought the character Bozer into the show and why he thinks that “personal stuff” makes an episode stronger. StuntTeam and crew engaged in the project “Toys for Tots” to collect Christmas gifts for children who otherwise wouldn’t have any this year. What a nice gesture! Central Casting Georgia has made several casting calls; e.g. for bus passengers and administrators, for Atlanta Policemen, for “great drivers who can parallel park like experts” and for people in their 20s-40s that can portray mourners. As already revealed above, we will get Murdoc, Nikki and Sarah Adler back for Episode 12. Reads like danger and action and plot twist. Peter Lenkov confirmed to a fan that MacGyver’s grandpa will make an appearance on the show “at some point”. Sounds like we might have to wait for the second season for this, though. Disclaimer: My original guest-post was first published on The MacGyver Project on December 8, 2016. I made some minor changes (e.g. grammar or source corrections, link corrections, additional pictures) before re-posting it on my own blog for safe-keeping. Additionally, CBS started a look back at some of their favorite tv-show-moments this year. The Reboot makes an appearance in their show-reels for “Stunts” and “Bromance“. 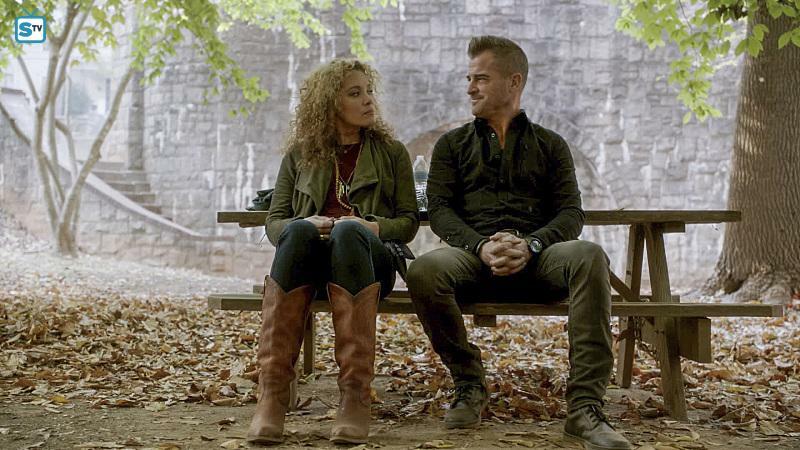 Executive Director Peter Lenkov shared a picture of MacGyver and Jack on a road trip and of Jack with a female character – a character who’s name Lenkov didn’t want to reveal yet. He did reveal that he had lunch with Henry Winkler, though. Also, Jack seems to drive a green minivan now. 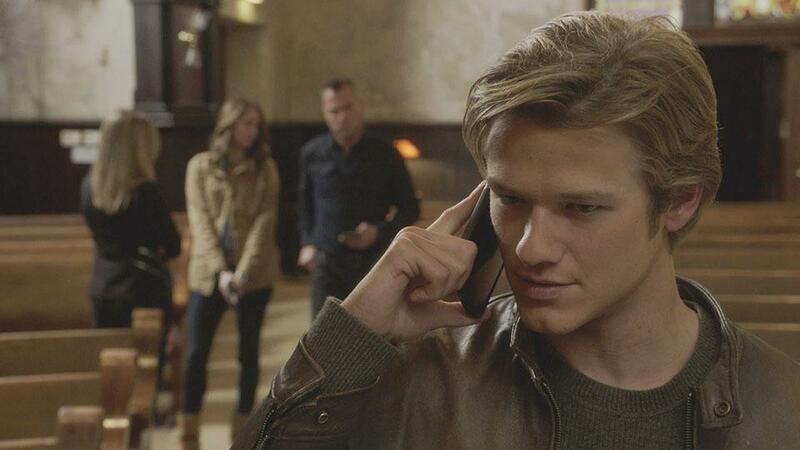 Lucas Till shared another picture of MacGyver doing bad, bad things – this time of posing with terrorists. Lucas is also seen in a picture with Extra Lyman Chen, who complimented cast and crew as being one of the friendliest he had ever had the pleasure to work with. Chen is listed for Episode 11 and it looks like there are Ninja Swords involved. Tracy Spiridakos shared what Amy Acker and the rest of the cast is up to between set ups. Meanwhile, the script writers were busy playing with drones or testing handcuffs – hopefully for new MacGyverisms. Amiah Miller shared a picture of herself doing voice-over work for this week’s Episode 10. We got a first look at a glossy black helicopter (probably for Episode 13) and at the lady pilot (played by Zulay Henao) that will likely crash it. Feels like MacGyver and Jack will come to rescue her, though. The helicopter must have made quite an impression on set – several crew members (e.g. Cornell Willis or RoxPaul) and the grip crew shared pictures. Lucky bypassers got to see cast and crew filming scenes with said helicopter on a rooftop in Downtown Atlanta on December 7. According to Todd Edwards who posted some pictures on Facebook, MacGyver gets beaten up, wrapped in blue tarp and tossed in – and then people start shooting at the chopper. Apparently the heavily armed “terrorists” looked so real that they scared the office workers in the building. Technical Consultant Rhett Allain wrote another piece on MacGyverisms – this time about “How to make an UV-light out of your phone’s LED flash” as seen in Episode 8 (Corkscrew). Additionally, he appeared on the “Lab Out Loud Podcast” on November 28, talking a bit about working on the show. Allain also gave some insights for an article on Popular Science about “5 MacGyver Hacks you should try at home” (laser microphone, fire starter, soda bottle gas mask, DIY eye in the sky and Leyden jar battery) and “2 you really shouldn’t” (car battery arc welder and thermite lance). I honestly don’t remember some of these MacGvyerisms – so either I’m getting old and forgetful, they were from deleted scenes or the episodes haven’t aired yet. I’ve been wondering why CBS chose these two episodes to draw new viewers in. To catch up on the backstories of the recurring female characters (mainly Nikki, but also Riley or Amy Acker’s character Sarah Adler), the pilot (The Rising) and Episode 2 (Metal Saw) would have probably made more sense – but the ratings of these two episodes are also the lowest on IMDb. SpoilerTV provided us with press releases and/or official stills for Episode 10 (Pliers) and 11 (Scissors). They also revealed the title for Episode 12: “Screwdriver”. Stills and Synopsis for Episode 10 remind me a bit of the “Ugly Duckling” Episode of the original show. Interestingly, Episode 11 will be directed by Stephen Herek. Many, many years ago, Herek had directed the unaired pilot episode for “Young MacGyver”. Considering how many people – mainly “Supernatural” Fans – are still commenting and being confused about Lucas looking like a young Jared Padalecki, I found this kinda funny. We finally got a preview and three sneak peeks of Episode 10 (Pliers) on December 7. 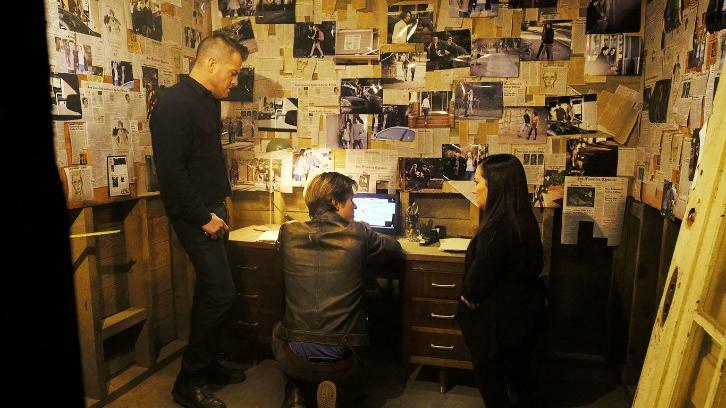 It seems like the storyline will focus a bit more on the friendship between MacGyver and Jack – or the so-called “bromance” that has been advertized endlessly in the promo cycle before the premiere of the Pilot Episode. Central Casting Georgia has made some more casting calls; e.g. for men who’ve had tactical defense and gun training; for Mom, Dad, and a 6 year old blonde girl to portray a family and for a “short Caucasian female” between the height of 4′ 3″ to 4′ 11″. The agency stated that this would be a regular stand in gig, working until mid-March. So it seems like there will be a young recurring character – does New MacGyver have a half-sister, maybe? As Matt Webb Mitovich revealed back in November, we will get to know more about Jack’s love life next year. This fits with the picture by Peter Lenkov and the synopsis for Episode 11, because we will meet Riley’s mother. Disclaimer: My original guest-post was first published on The MacGyver Project on November 25, 2016. I made some minor changes (e.g. grammar or source corrections, link corrections, additional pictures) before re-posting it on my own blog for safe-keeping. While the reboot is taking a break and airing reruns, cast and crew are working on the mid-season finale. Also, Amy Acker and Tracy Spiridakos are back on set! As I mentioned before, we don’t see much exclusive stuff anymore from the main cast. They’re busy bees to wrap up the initially ordered episodes before Christmas Break. As Tristin Mays revealed on Twitter, they’re often still filming while the new episodes air and don’t get to see the premiere. Lucas Till posted more pictures of MacGyver doing bad, bad things like aiming a gun and being friendly with terrorists. Of course, this led to David Dastmalchian pulling out a big gun of his own (ahem, this doesn’t look as R-rated as it sounds). Tristin shared that Episode 9 (Chisel) has been her favorite episode to film so far besides Episode 4 (Wire Cutter). Justin Hires’ Stand-In Kevin Marshall Pinkney posted a picture of him sitting in a 60’s Volkswagon while working on Episode 12. Guess we just got to see Bozer’s car? Interesting choice! On November 14, Just Jared shared paparazzi pictures of Lucas on set. As several crew members (e.g. Cornell Willis or Kait C.) revealed, they were filming in a church on November 21. Thanks to Camera Operator Tiko Pavoni, we got a glimpse at MacGyver’s “back yard”. Brian Durkin revealed how the writer’s crew tested MacGyver’s escape in Episode 8 (Corkscrew). The script writers also provided the original diagram of the Chinese Lantern Surveillance Drone in Episode 9 (Chisel) and the math equations that Tech Advisor Rhett Allain did to estimate how much paper MacGyver would need to stop a bullet. On November 11, Lucas’ Mom had visited the set. She shared some pictures on social media. While filming outside on November 14, the set got visited by an elementary class. Learning about TV production directly from cast and crew on set is sure more interesting and memorable than regular class! As expected, Episode 8 (Corkscrew, 7.65 million) got better ratings than the previous episode – although they weren’t as high as I expected (it was the return of beloved Murdoc, after all). Overall, New Murdoc’s first appearance was well received on Twitter and even got praise by Original Murdoc Michael Des Barres. The most recent Episode 9 (Chisel, 8.12 million) made the third-highest ratings of this season. SpoilerTV provided us with a press release for Episode 10 (Pliers – although thanks to the Phoenix Foundation Podcast, that episode will always be “Pilers” to me). Episode 10 will air on December 9 because the show is taking a break and CBS airs reruns on Fridays instead. Tonight, they will show Episode 3 (Awl). Looking at the surprisingly high ratings from last week, I’m not sure if it’s a wise decision having a break of 3 weeks, now with so many people stating on social media that the episodes are getting better and that they finally started to like the show. On November 16, CBS uploaded some more BtS-pictures; mainly from Episode 7 (Can Opener). They also provided a Survival Guide for Thanksgiving. The CBS Watch! Magazine provided another picture of their photoshoot with Lucas and George for #ManCrushMonday. ET Online visited Lucas Till in his Hometown. We got to meet his mom, his younger brother and a high school friend. In an interview with TVLine, Lucas talked about Nikki, Murdoc and his favorite MacGyverism. The soundbites aren’t new, but in an interview with TV Insider posted on November 25, Executive Producer Peter Lenkov affirmed that he’s still planning on a crossover with Hawaii Five-O. In case you wondered what had happened to the huge Wall Painting on Hotel Figueroa in LA that was made back in the first promo wave: It got painted over with an ad for Apple’s iPhone. Central Casting Georgia has made several casting calls; e.g. for men who are trained with guns, for business men and women who own expensive luggage, for wedding guests, groomsmen and bridesmaids and for hispanic looking males with upscale wedding guest style attire. The masks of the Asian General and George Washington were made by Larry Torro. He provided a picture of the president’s mask from Episode 8 on Instagram. I think the masks look very good and I really hope we’ll see more of them, now that Bozer has joined the team. Amy Acker recently revealed at a convention in Asia that she will be back on the show. On November 18, Peter Lenkov posted footage of a scene of Amy’s character Sarah with Jack; confirming that she’s already been filming her scenes. On the same day, Tracy Spiridakos posted a picture on Instagram that confirmed she was also back on set. Interestingly, Preston James Hillier (who’s played Amy’s boyfriend / fiancé Jeff on Episode 2) also tweeted on that day; saying that he enjoyed to work with Lucas and George again. What’s even more interesting is a comment on that tweet that was later removed (after I pointed out to this person that this tweet might be a spoiler – you’ve been warned!). The deleted tweet complimented Preston and made a statement about being a proud mother of the groom. We already know that there will be a wedding scene in this season and that they’ve been filming in a church; so I’ll predict that Jack will get his heart broken in the mid-season finale (for now, Preston is listed for Episode 12 on IMDb).